GMER is a new hidden services, hidden registry, hidden file scanner and also other features. It is a very nice piece of software and has a very nice user interface which makes it very easy for non technical people to use. Dont download... Just downloaded this pile of extrement, extracted the zip file. I donwloaded directly from the homepage.... ran Gmer.exe... followed BANDIT's instructions. everything selected except 3rd party. click scan.... the BSOD or Blue screen of death. I am running windows 7. 16gb memory, so it shouldnt have happened. being a BSOD there was no information from the app as it being infected of anything. I wont be running this app again. IF i could get it a -100 i would. Launch & a quick scan Starts ... Under the RootKit/Malware tab. 1st Run (Advice) ... Disable your A/v & ANY other (RealTime) Monitoring Apps. -An Auto-Scroll would be nice..!! -Large Drives & Lots of Proggys = Twiddling Thumbs. 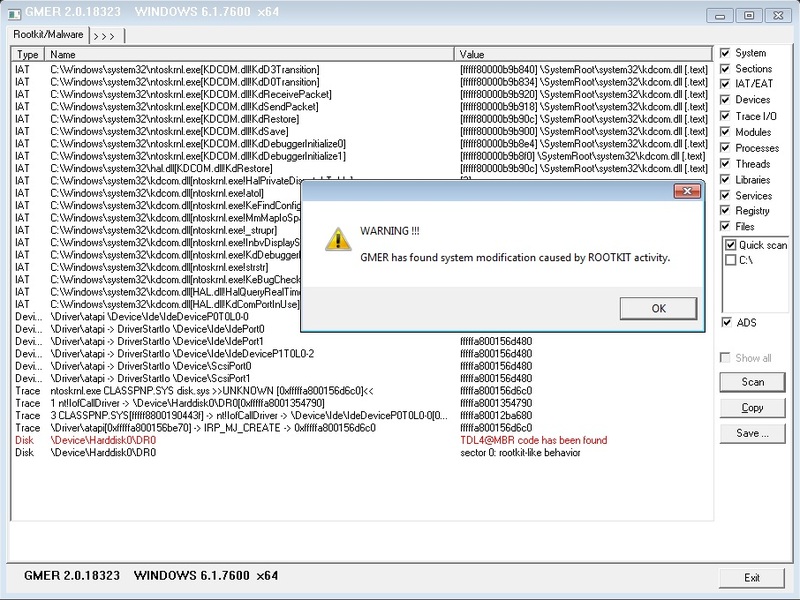 RESULT:- GMER has found system mods caused by RootKit activity. Scroll down the Results & a comprehensive list of Mods to Sys files & Reg keys is revealed. The ones Hi-Lited in Red are the Worries..!! This App Doesn't have a Delete key & That is a Good point. You can save the results Either via ClipBoard or Directly to File.... You MUST know which Apps you have on Board, & associated Reg Keys............ Sooooooooo..!! This App is a TOOL for Techys "Fault Finding" Rather than a scanner for @Noobs to Fiddle with. The Preview "ABOVE" of this Software by the Authors is a little Misleading.... The last few words (..... non technical people to use). Refers to the UI .... And NOT the Results..!! their website has not been updated to reflect the latest zip build. 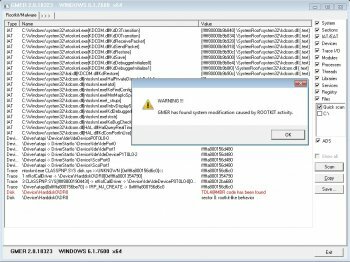 Best to DL the exe which is the latest 15281 build from website.